One can’t help but think the Winter Olympics wasn’t somehow on the minds of menswear designers planning their spring lineups given the abundance of athletic, outdoorsy, rugged looks shown for gents this year. 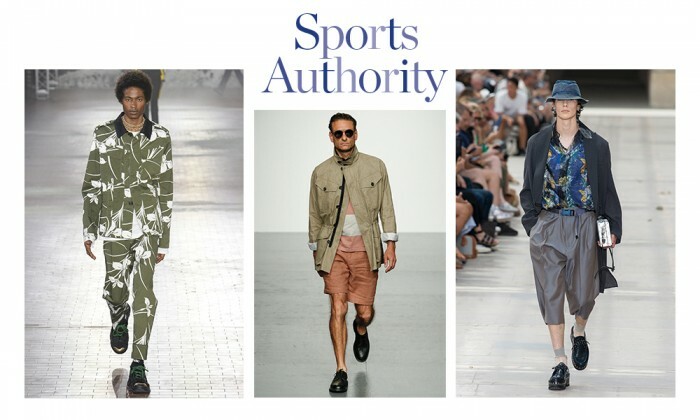 The agrarian-inspired man’s man was on display everywhere with technical fabrics, athletic shapes, Safari suits and surf garb. It was even apparent in the grooming. Any proper sportsman knows that more than anything, one has to be protected from the elements. Enter parkas and anoraks that would be right at home in wooded forests or sprawling steppes though the funky colors and wily shapes would be much better acclimated to coffee shops, dive-y bars and city streets. LANVIN had a zip-up jacket with a swirly blue pattern that looked like a lava lamp. It was layered on top of another nylon hoodie complete with drawstrings and utility cord locks. Even the sneakers were a spruced-up version of rubber rock climbing shoes. HERMÈS on the other hand, remained true to its gentleman aesthetic and simply layered its iridescent green lizard shell under a classic blazer paired with pleated slacks. BALENCIAGA may have had the most practical of parkas in a completely translucent, vinyl, hooded version. But what explorer trope would be complete without the oft-referenced safari? OLIVER SPENCER lifted an image straight from a sweltering savannah in old British Colonialist lore with its sand-colored, four-front-cargo-pocketed jackets. N°21 was on the same page but it was almost completely camouflaged in the oversized floral print. Speaking of florals, there was also a bevy of Hawaiian-printed surfer shirts. LOUIS VUITTON was taking you straight to the North Shore in look after look of wild button-up floral tops. 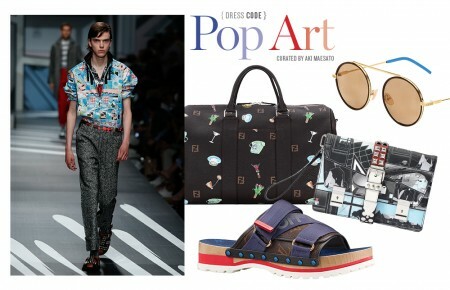 BALENCIAGA had surf, flowers and perhaps even 80s Miami on the mind with a print that was paired with fabric-blocked pants and black New Wave sunglasses. One wouldn’t imagine a perfectly clean cut, groomed appearance would accompany all this roughing it. Consequently, there’s a return of the bushy Tom Selleck mustache and with it, longer hair landing somewhere below the chin, although it seems best to choose one or the other. That is unless your habitat doesn’t consist of walls, regular hours and rules. In that case, it might just be best to forget all of this and go to REI.